In honor of Valentine’s Day I searched the Clarke holdings for a collection of love letters. We have two files of letters exchanged in the 1890s that could be described as a collection of love letters, though both correspondents appear reluctant to commit the word “love” or “lover” to paper, preferring “friend” or “ever true friend.” This is not unusual, given the time and place. 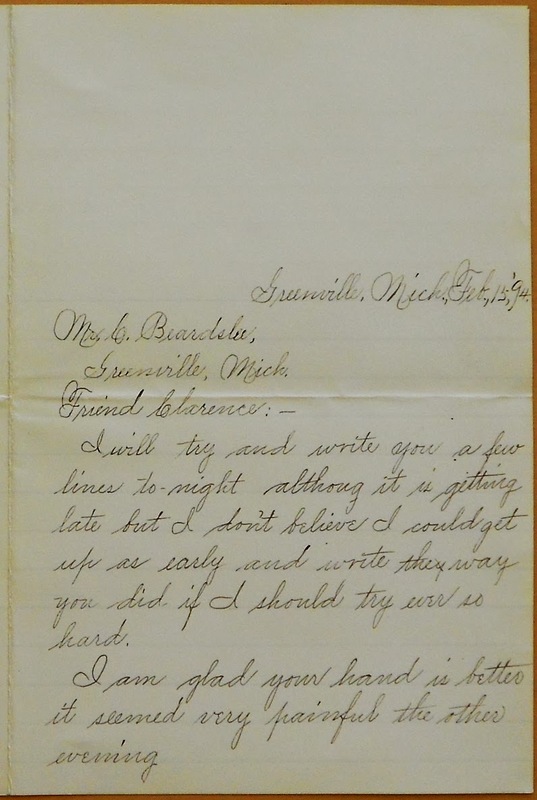 The two sweethearts, Lucy Luscombe and Clarence Beardslee, grew up in Greenville, Michigan, and the letters they exchanged provide a glimpse at romance in rural Michigan at the close of the 19th century. Letter from Clarence, July 10, 18?? “Well, Dear Lucy,” writes Clarence, “it seems like a long time since I saw you.” “Friend, Clarence,” writes Lucy, “write soon and often.” The letters do not reveal the exact ages of the correspondents. For certain, Lucy is in school. It is not clear that Clarence still goes to school. He is probably older. He works long hours on the family farm, chopping wood, cutting rye, killing hogs, grubbing potatoes. He is a hard worker and will have to provide for Lucy if he hopes to marry her. The work keeps him from visiting her as often as they both would like. They communicate through letters. Lucy writes longer letters. She has better penmanship. Grammar and spelling are not strengths of Clarence. “Lucy your Letter’s does me the most good of any Letter’s I get.” They see each other once a week, usually on Sunday evenings, and endure the hectoring of siblings. Clarence writes of his sisters, “the girls bout hector the life out of me about us feeding each other candy.” In the letters Lucy and Clarence worry over and comfort one another. “I was sorry to here that you were so sick dear L. and I hope you wont hafto be trubbled that way very often.” Lucy calms Clarence when he is upset over her mother calling Lucy inside one Sunday evening. “You must not think anything about her calling me in,” she writes, “and you surely would not if you had lived with her as long as I have.” Clarence in another letter confesses it was “a hugging be[e]” that Lucy’s mother had interrupted. We like happy endings, especially on Valentine’s Day. They married. We know this from Clarence’s account book which can be found in the collection. Along with the cost of fertilizer, the price of hog and chicken feed, and the expense to repair the barn roof, Clarence recorded in his accounts the many purchases he made for his wife. On March 27th 1904 he paid $8.25 for a “Washing macine and a Ringer.” That might not light up a woman’s heart today, but it probably did Lucy’s. Later accounts showed more luxury items. 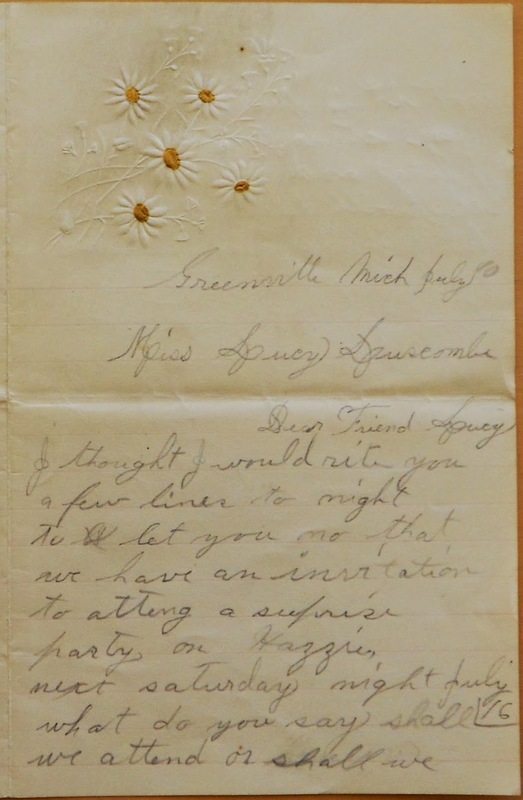 In October 1943 Clarence bought “Lucy a hat & pin.” The last love letter in the collection is dated 1896. According to his account book, fifty years later Clarence was still sending Lucy valentines.